In the latest episode of the 1up.com podcast 1up FM, there is a great discussion of the game Shadow of the Colossus that starts around about the 1:26:00 mark. I like this Backlog feature of theirs-- they've been playing through the game over the last month, and talking about it as they go along-- because it offers a much-needed outlet for discussion of games after they've been reviewed. As a result, the discussion moves beyond how fun the game is to play (the standard review assessment) and into the way the game influenced the panelists' views about larger questions in game criticism. A perspicuous and reasoned debate ensues in the last ten minutes about the role of narrative in games and the differences between narrative in games and in cinema. I found all this fascinating because I think that Colossus is a model for how narrative ought to be done. The capacity to convey narrative through interaction is a constitutive rather than accidental feature of the medium. Every time a designer exploits this ability we get closer to finding out what kind of art games are, and what forms of expression are unique to games in comparison to other media. The first game I remember ever fundamentally altering this formula was the original Legend of Zelda for the NES. At the end of the second dungeon, you were faced with a Dodongo, an enemy that differed from all your previous enemies in kind rather than just in degree. The rhino-looking bosses could not be defeated by normal sword slashes; rather you had to get him to swallow your bombs by laying them out in front of him. You had to figure this out on your own by experimenting with your various items. This fight, simple on its own, is the seed of two great design ideas, both of which have been developed to an impressive degree of maturity. The first idea is using boss fights to test the player's knowledge of the existing game mechanics and to teach her to apply them in new ways. (You can think of the Dodongo fight as the discovery of a new “rule” for the use of bombs.) In the later installments of the Zelda series, each dungeon would have a series of puzzles and obstacles organized around the use of an item found in that dungeon. And then the boss would be a sort of “final exam” to test your mastery of the new rule the game taught you in the dungeon: you had to use the techniques you've used throughout the dungeon in novel or more complicated ways in order to damage the boss. This template was perfected Legend of Zelda: The Ocarina of Time and descends into mannerism in Phantom Hourglass. This approach to boss battles has been a hallmark of the Metroid Prime series, and Okami used this idea to great effect by applying the principle to many of the game's non-boss enemies. The second design idea nascent in the Zelda fight was making boss battles into puzzles. Beating bosses became not just a matter of moving faster and inflicting more damage, but fundamentally a matter of problem-solving. Just managing to inflict any damage at all became the central challenge of the fights. In the Zelda games you had to keep an eye on your environment and the boss' behavior in order to discover the trick to beating the bosses those games threw at you. Reasoning this solution out produces these “aha” moments-- moments where you recognize the designer's mind at work-- that are Zelda's great gifts to gaming. I see Colossus as the consummation of this latter stream of evolution. Shadow of the Colossus introduces a minimalist set of game mechanics: riding, shooting arrows, climbing, stabbing. It eliminates all the levels and battles with regular enemies, and substitutes the exploration of a large and mostly featureless world. (This game has extremely slack pacing; it contains some long stretches of eventlessness that would make Andrei Tartovsky proud.) And finally, it constructs a set of meticulously designed environmental puzzles in each colossus encounter. These innovative design choices (along with its beautiful visual style and its subtle approach to narrative) make Colossus a unique experience, even though its basic gameplay ideas are part of a long tradition. It exemplifies a pattern that is true of other works of art: it draws upon the established forms of its forebears and transfigures them into something noone has ever seen before. great blog! the only thing missing is a link on the side to the awesome blog, "The 2nd Exodus." 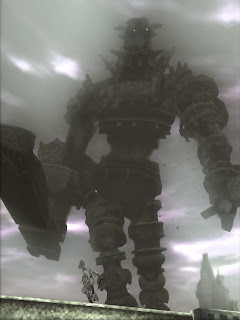 Also, the final colossus dramatically raises the emotional stakes, in a single gesture, without saying a word. How many games can say that? It isn't an especially difficult fight in terms of technique, but by my count there are at least three entirely new emotional hooks attached to the last battle. So in a sense, the "boss of bosses" is by far the most difficult kill in the game. You're right about that last colossus fight; as I mentioned in the post I think the way that game handled emotion and narrative is really remarkable, I just wasn't sure what to say about it there. What I really liked is that the emotional force of those moments in the last parts came all from connections that are forged through gameplay rather than through cutscenes. Well, it's tough to describe the experience without massive spoilers that wouldn't describe it very well anyway. It's really something that needs to be experienced first hand, because as you say, it's all tied to the play rather than cutscenes, although there were a few in the game. I think that cutscenes are unfairly maligned in this new era of total action-packed constant interactivity, but that's another discussion. The best parts of SotC absolutely require agency on the player's part, so that they can consider the implications of what they've done. It's been said before, but wow, what an amazing game. I keep waiting for any news on Fumito Ueda's next game, but without as much as a peep. I stumbled across your blog through the Brainy Gamer and I'm very glad I did so. I'm enjoying the exploration of rules. Keep up the engaging work. @jv: I was sort of bummed that there was no news about the ICO team's new project at E3. I am led to think that there might be some news at the Tokyo Game Show, which would be good.